This is just my kind of book! I love books about popularity and parties--not sure why since I'm way past high school age, but it's just one of those topics that always seem to get me. I was expecting this to be a fun, fast read, and it didn't disappoint. Firstly, the book is set in Pittsburgh, the South Hills to be exact, so I'm a little biased. Living in Pittsburgh my whole life and loving my city as much as I do, I definitely appreciated a book with a 'Burgh setting. I loved seeing The South Hills Village Mall, talk of the Steelers, familiar radio stations, landmarks, highways and streets. It's not often I get to see Pittsburgh stuff in books! 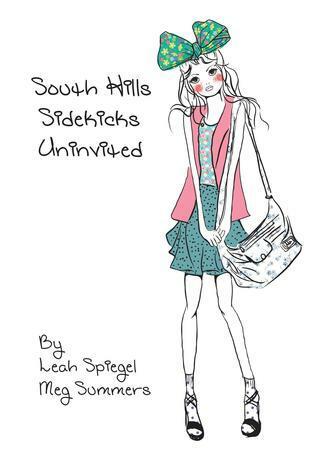 This book is a little bit Pretty Little Liars, a little bit Clueless, and a little bit Mean Girls. It's got the mystery and investigating aspect of PLL and the characters/charm of the movies I mentioned. It's about a missing girl, but it's also really funny and silly at times too. While Alley, Val, Libby, and Kayla are investigating Kristen's disappearance, they focus on the new guy, Shane. This leads them into some really interesting situations that only a group of teenage girls could get themselves in to. Shane definitely has secrets that need uncovered, and it really had me wondering. There is a romance plot in this book as well which I won't give you a lot of details about. It was little bit of a forbidden-thing going on... and even though it seemed completely impossible at times, it still added a lot to the book and was one of my favorite parts. The only thing I didn't like about this book was I wanted Alley to stand on her own a little more. I didn't really get the appeal of Val and why she felt like she needed Val to be accepted into the group. Also did Val really need to be that over-the-top klutzy?? I could lived without some of that. Overall: A cute, fun mystery that will have you laughing at times and staying up turning pages in curiosity. I definitely recommend it to fans of Ally Carter books, and also a must-read to girls from Pittsburgh!